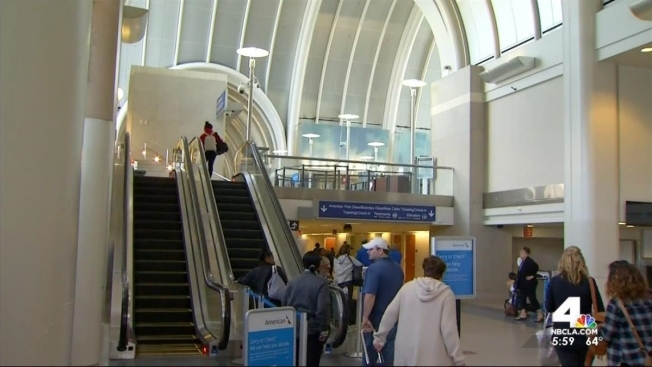 Authorities are looking for a flight attendant who fled Los Angeles International Airport without shoes Friday night after being subject to a random search that turned up about 70 pounds of cocaine in two carry-on roller bags, authorities told NBC News. The flight attendant, like other crew members, is not normally subjected to searches. But just after 7 p.m. Friday, the unidentified JetBlue flight attendant was pulled aside by TSA officers for a random screening in Terminal 4, law enforcement sources familiar with the incident said. The woman, who was not identified, appeared nervous and made a cellphone call in a language not recognized by officers, authorities told NBC News. She was then taken aside to a secondary screening area and was asked for her employee identification. Suddenly, the woman bolted from the screening location, running with her bags toward an escalator. After a short distance she jettisoned the luggage and her Gucci shoes, exiting the terminal. It was not immediately clear which flight she was set to board. DEA spokesman Timothy Massino said the woman faces felony drug charges. Angie Crouch contributed to this report.